Do you live in as small, cramped apartment with hardly a counter, much less space for a full-sized blender? Perhaps you’re the only one in your family who’s about to start changing their diet and life and don’t need much more than a good blender whose cup you can take along for a jog? 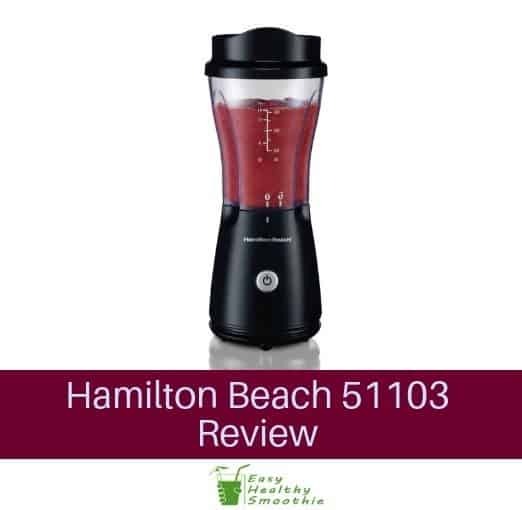 Hamilton Beach’s 51103 is the fun and surprisingly effective answer to your health drink needs. Small enough to be used in an RV, simple to use, and cheaper than some of the ingredients you’ll be blending in it, the 51103 is a personal blender you’ll love to use anywhere, any time. Colorful, compact, and cute as a button, this blender looks as good as the shakes it makes taste. It has an on button that doubles as the pulse setting – sweet, simple, effective. There’s only one button to push, so using the 51103 is as easy as can be. Adequate for everyday use, but may not survive being dropped from your counter. Overall a well priced and convenient on-the-go smoothie maker! Here's a good unboxing video I found on YouTube, that gives you a very detailed look on what you get when you buy a Hamilton Beach Single Serve Blender. People who find themselves strapped for cash or can’t come up with more counter space to save their life will find the 51103 a godsend! It’s the perfect little personal blender you can take out from the tiniest of storage spaces, set it up anywhere, and have a healthy meal ready in minutes. Since it comes in one of five different fun colors and is extremely easy to use, the blender is sure to be a hit with kids as well. As you’d expect from such a compact and affordable blender, there’s not much in the package. You get the base, the handy 14-ounce travel jar, its BPA-free lid, and a quick-start guide. At first glance, this blender looks more like a toy than the capable smoothie maker that it really is; given its size and range of tasteful color options, this isn’t surprising. It’s a cute little blender that takes up such a tiny amount of space that you probably won't want to put it away even if your counter isn’t very big. Not that you’ll need to as it’s only 10 inches tall and its base measures at 4 x 5 inches. Even so, this Hamilton Beach blender is sturdy for its size and stands on four tiny legs that root it into place. Towards the bottom, there’s room for the power cord to be stored so that even less space is taken up when the blender isn’t in use. The self-standing jar can be taken off and stored separately if you lack vertical space too. The jar has clearly visible measuring marks and holds 14 ounces, enough for a personal dose of leafy or fruity goodness you can reward yourself with after a morning jog. Or, you can take the jar with you and drink from it anywhere since it has a tight-fitting plastic lid complete with drinking spout. Using the spout prevents spilling and lets you enjoy your drink while on the move. You’d think that a blender as small as this one would also be weak, and you’d be in for a pleasant surprise! Sure, the 175-watt motor isn’t exactly a powerhouse, but since the portions you’ll be preparing are small, it will have no trouble liquefying enough ingredients to fill up the whole cup. We tested it out with some frozen berries, leaf spinach, and almonds. The bleeder tackled all three without a hitch, although blending harder ingredients like walnuts might nick the insides of the jar, so keep that in mind. Apart from being comparatively powerful, the blender’s motor is also one of the quietest ones we’ve tested. It’s a pleasant side effect of the motor’s smaller size both you and your household will appreciate when you’re making a kale smoothie at 5:30 in the morning. Even the best motor couldn’t get your blender anywhere without good blades, and the ones that come with this blender perform well most of the time. They’re made from stainless steel and some of them are angled downwards to catch and blend any pieces that have fallen under the blade assembly. They are on the thinner side though and may not be suitable for crushing ice cubes, you’ll want to avoid making sorbets. As far as personal blenders go, Hamilton Beach makes some of the best in the business. Here you’ve got a blender that won’t even set you back $20, but which still has more than enough power to quietly turn your favorite ingredients into tasty drinks. The fact that you can use it in a kitchenette at the office or take its contents with you without making a mess only add to its already considerable value. It’s important to realize where its limitations are though. If you’re keen on turning your family on to the health buzz or want to tackle ice and other challenging ingredients, you may want to go for a model with a bit more power. As long as you treat it like the personal smoothie maker it is designed to be though, this blender will probably continue to enrich your diet for years to come.